Russia’s biggest crude producer agrees to buy Morgan Stanley’s oil merchanting assets as it ramps up cooperation on new fields with U.S. major ExxonMobil. Russia’s largest oil firm, Rosneft, purchased Morgan Stanley’s oil trading and transportation business in a move that gives the firm a new presence in the United States, as it prepares to tap Russian oil fields with its U.S. strategic partner, ExxonMobil. The purchase follows Rosneft’s ascension to the No. 1 spot in global oil output after buying out private investors in BP’s Russian oil venture, TNK-BP, last March. The Morgan Stanley deal “represents a breakthrough in strengthening Rosneft’s commerce and logistics unit, which will spearhead the company’s growth in the international oil and products markets,” Rosneft CEO and chairman Igor Sechin said in a statement accompanying the news in December. 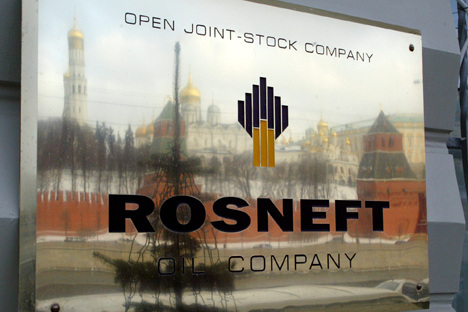 The agreement involves the sale of an international network of oil trading, storage and shipment facilities, along with 100 front-office executives – including oil traders in the U.S., U.K. and Singapore, or roughly a third of Morgan Stanley’s total commodities “merchanting” personnel – Rosneft said in its recent statement. The terms of the deal were not disclosed. The Wall Street Journal cited an unidentified person familiar with the details of the transaction as saying that the sale will cut about $4 billion in risk-weighted assets from the Wall Street firm’s balance sheet. Rosneft, which is majority-owned by the Russian government, has emerged over the past decade from relative obscurity to become the world’s biggest oil producer, responsible for four out of every 10 barrels of crude that Russia produces. Sechin, a close ally of Russian President Vladimir Putin, has extended Rosneft’s reach beyond Russia’s borders after consolidating large swathes of the country’s privately held energy assets under the state-owned company’s control. The deal with Morgan Stanley comes as Rosneft is ramping up cooperation with its strategic American partner, Exxon. Rosneft and Exxon are scheduled to begin drilling the first oil wells in the far-northern Kara Sea and in the Black Sea together this year. The firms are also preparing to tap Siberian fields and export liquefied natural gas from Russia.